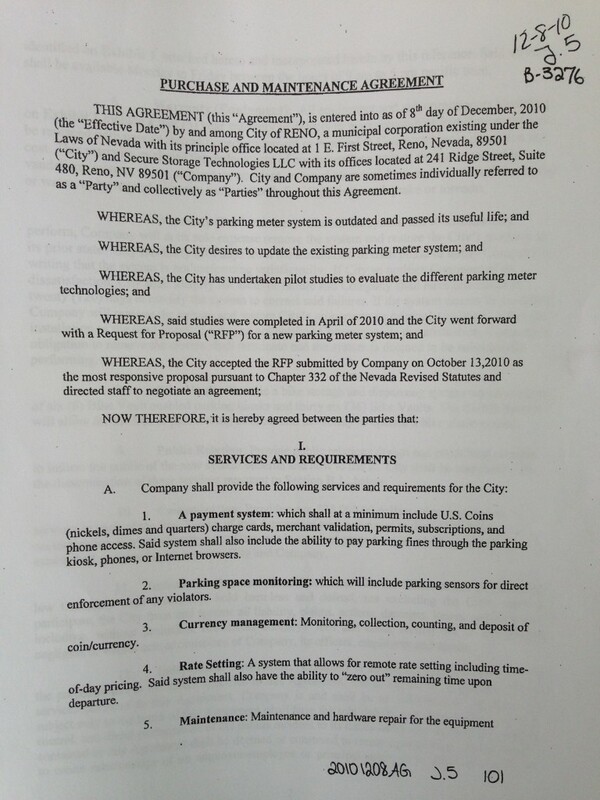 1) On the original contract for the parking kiosks in Downtown Reno, the name of the contractor was Secure Storage Technologies LLC. Secure Storage Technologies LLC, was required contractually to provide a performance bond in the amount of $460,000 as well as a lien release before they were allowed to begin work on the project. The bond was never provided, and as many citizens found out, the kiosks were a complete failure as a project. 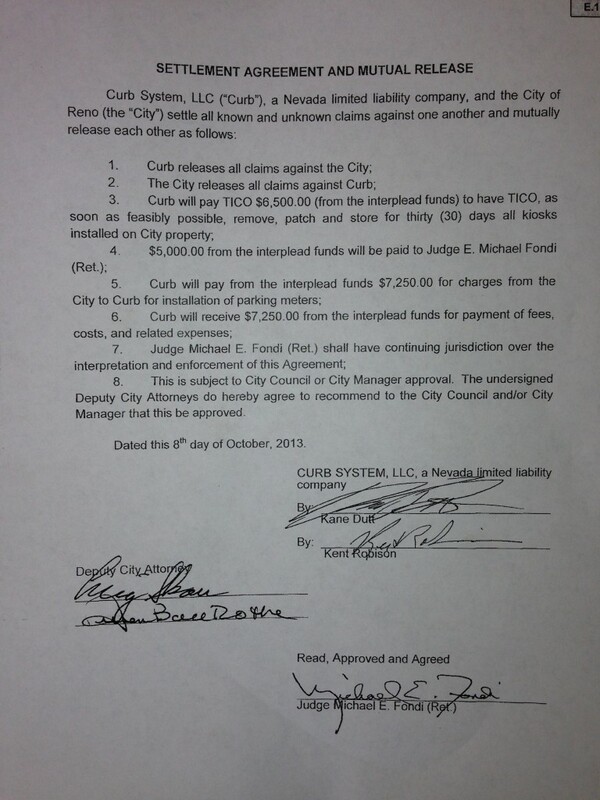 As of now, there is a completed settlement between the City of Reno and Curb Systems LLC. (See below for photo copies of the settlement and original contract pages.) 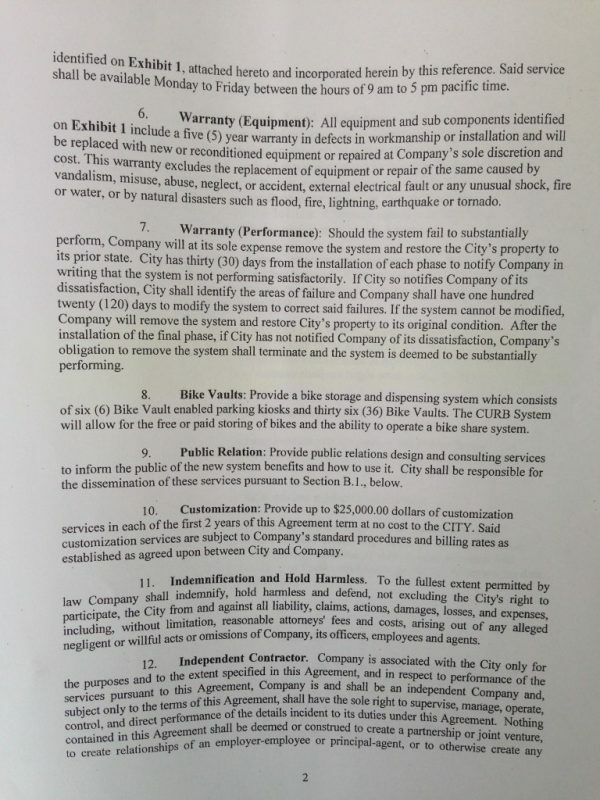 I found it odd that the City of Reno initially contracted a company which is a profitable organization to build the kiosks, but when the contract was not fulfilled, a different company steps in and is being held legally liable to pay the settlement when the City of Reno is owed a $460,000 bond from Secure Storage Technologies LLC NOT Curb Systems LLC. 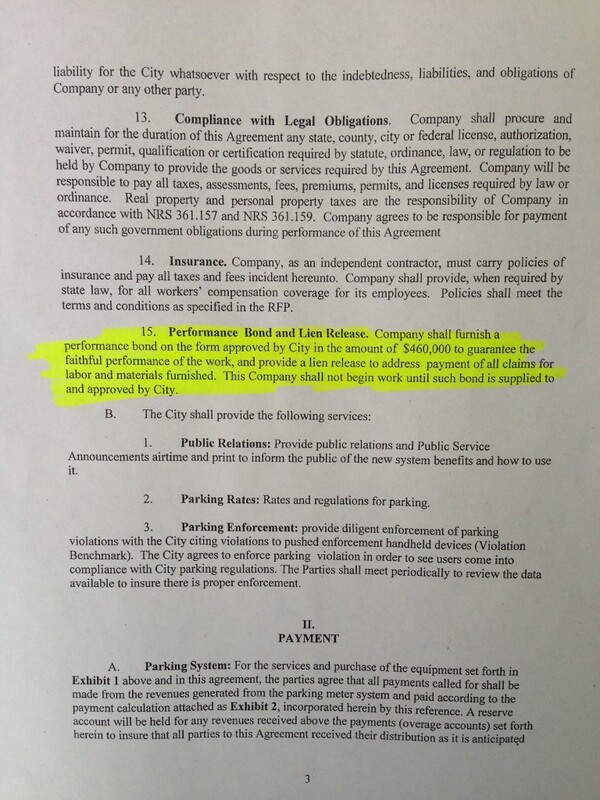 What reason is there to change companies at the end of the project when impending legal issues were arising, and why is the company that owes the City of Reno a $460,000 bond not included anywhere in the settlement mediation? Further, why was the bond never paid? 2) What instrument was used by the city to LEGALLY change the name from Secure Storage Technologies LLC to Curb Systems LLC? 3) I made an inquiry with Lynette Jones, the City Clerk, for this information. She returned my call after speaking with an undisclosed city attorney, and responded by saying that there was no legal obligation to divulge this information publicly. In a city that has major financial woes, in which I am a resident that sees a blatant mismanaging and loss of funds, I find that answer to be unacceptable. I merely want to know, what is there to hide? It’s easy to point out the mistakes that our current city officials have made, but I am not interested in finding the mistakes, I am interested in finding the solutions. If I were in office, I would never have allowed for the name on the contract to be changed at settlement, and I would never have accepted ANY settlement without the bond being paid, let alone a settlement that is .016% of what is actually owed. This is the fiscal irresponsibility, that I believe needs to change. This is the fiscal irresponsibility, that I would never allow in an Eddie Lorton mayoral office.